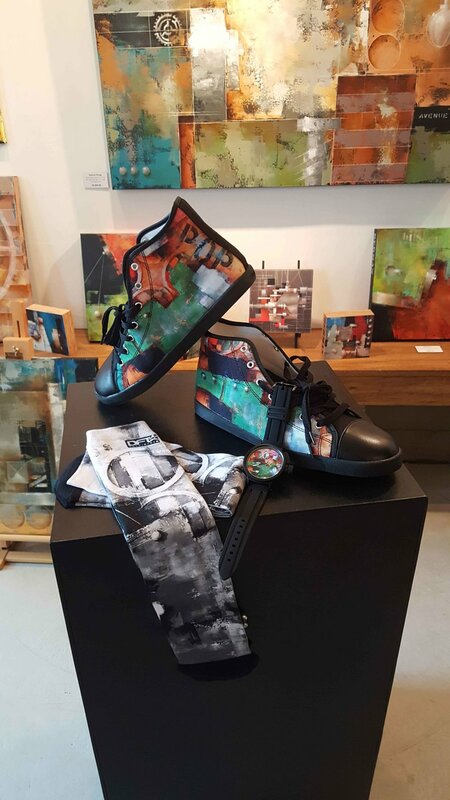 DF13 Skateboards has created the Ken Berman Collection - a product line featuring my artwork on skateboards, sneakers, socks, t-shirts and other fashion forward items. They look fantastic and show how photogenic my art can be (not only in color but black & white as well). The lead designers at DF13 have a particularly good eye for fashion and composition and really found a way to make the most out of the imagery. Click The Ken Berman Collection for the link to the DF13 Skateboards website. One of the goals in teaming up with DF13 was to widen the appeal for both the DF13 brand and my artwork as well. Residing in Sonoma County, CA as I do there are limited opportunities to increase the visibility of my artwork so heading back east to my east coast roots and networking with other like minds makes sense creatively and economically. And using the internet to do it makes sense as well. The internet is vast with lots of room for growth. Who knows where the ship will sail but the winds will most definitely take it somewhere. As Nelson Mandela said "It Always Seems Impossible Until It's Done". Here's to getting it done!! Here's a little music to accompany the post. I love the lyrics. The song is called "Double Life" and was written and created by The Cars who were recently inducted into the Rock & Roll Hall of Fame. Kudos to them! !